Five hundred years ago, on October 31, 1517, Martin Luther touched off the Protestant Reformation when he nailed his "95 Theses" to the door of the Castle Church in Wittenberg, Germany. That was not his intent. He was a Catholic monk who taught in a Catholic university. 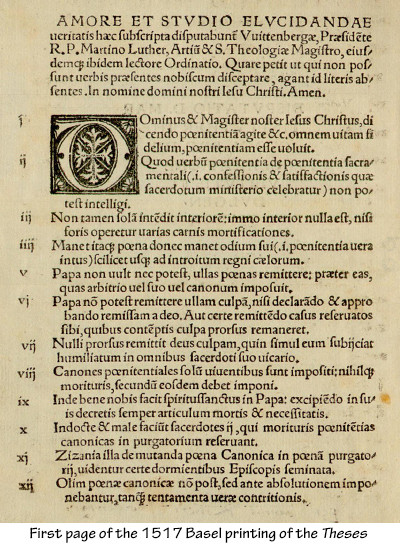 He wrote his 95 theses in Latin, which he intended to be read only by church theologians. The first two theses contained Luther's central idea that God intended believers to seek repentance and that faith alone, and not deeds would lead to salvation. What he challenged was the church's sale of indulgences which were marketed as a way to buy one's way into heaven. Even worse, indulgences were sold to forgive sins of people who were already dead! John Tetzel, a German monk, sermonized: "Don't you hear the voices of your dead parents or other relatives crying out, `Have mercy on us, for we suffer great punishment and pain. You could release us with a few alms..."
The alleged purpose of the sale of indulgences was to raise money to build St. Peter's Basilica in Rome. But various bishops took half the booty for themselves. This corruption outraged Luther. He felt the Catholic Church had become too corrupt to provide people with the guidance they needed to obtain salvation. Luther, who had never read the Bible until he was 20 years old, felt that individuals could seek salvation on their own, without relying on priests by simply reading the Bible. An unknown individual translated his 95 Theses into German and reprinted them in a pamphlet that was distributed across Germany. Catholics had been told that they would have to spend extra time in purgatory before reaching heaven, or wind up in hell if their sins had not been forgiven. Indulgences were sold as a "confession insurance" against eternal damnation. The thought of the church selling forgiveness angered Luther. His challenge to papal authority received support from German nobles who had their own grievances with the church. Their support outraged church leaders such as Pope Leo X and the Holy Roman Emperor who charged Luther was guilty of heresy. They demanded that he recant. He refused, which led the Pope to excommunicate him - and to a trial at the Diet of Worms, a Catholic court in the German city of Worms. Again, he refused to confess error, famously saying: "Here I stand. God help me. I can do no other." Luther might have been executed, but was "kidnapped" by friends who took him secretly to the Wurtburg castle where he translated the New Testament from Greek into German in 10 months. It was published in 1522. He also translated the Old Testament, finishing it in 1534. Germans could then read the whole Bible. This was revolutionary. R.T. Kendall, a Biblical scholar, asserts, "Ordinary people didn't know the Bible because they didn't have Bibles. The Roman Catholic Church did not want you have Bibles. They just told you what the Bible said." By contrast, Luther defined the doctrine of salvation by faith, dependent upon scripture alone. He emphasized Paul's letter to the Romans 1:17 - "The just shall live by faith." He scandalized some by relinquishing his vows of chastity by marrying Katherine von Bora, a former nun in 1525. Not only was their marriage a happy one, it also set an example for the marriage of pastors - another element of the Protestant Reformation. German church services became quite different from the Catholic Mass in several respects. First, they were conducted in German, the language of the people - not Latin. I grew up Catholic, and remember that Mass was still in Latin, 450 years after Luther. However, the Second Vatican Council gave permission for Mass to be in the local language of the people. A second reform was in the music. Traditional Catholic services only had choirs sing, but in Lutheran churches the whole congregations sang. Luther wrote many hymns such as "A Mighty Fortress Is Our God." Finally, the pastor's sermon was the centerpiece of Lutheran services which might take 20-30 minutes. Catholic Masses might omit the sermon altogether, or feature only a brief one. The centerpiece of the Mass was the consecration of the bread and wine as the body and blood of Jesus. Many Protestant churches have communion only once a month or less frequently. Catholics stopped selling indulgences centuries ago, but were slow to allow Mass to be in the vernacular. But priests still must be celibate. Isn't it time for Catholics to make celibacy optional, and permit married priests? That Lutheran reform would end the shortage of priests!